On Friday 29th of January 2016 we – Wyatt Park Residents Group – took Michael and James Overton owners of Hambridge Homes to court for failing to notify us they were digging 30 foot deep excavations inches away from our Edwardian brick walls. Neither did they tell us they intended to erect 3 storey prefab-like concrete blocks with HUGE windows looking sinisterly improperly directly into our children’s bedrooms. Hambridge Homes’ construction caused 3 garden walls that had previously stood for over one hundred years to collapse and large deep crater-like sink holes to form. Though this was bad enough things could have been a great deal worse, people could easily have died! We’re thankful this didn’t happen but wonder what their buddies Lambeth would have done if it had? The collapse of walls meant families were afraid to go into their gardens, fearful of what would happen next. So OUR gardens became no go areas?! About a dozen of us were at court but father and son building duo – Michael and James Overton did not attend. They’d sent along a barrister to argue we’d completed the legal forms incorrectly. Our hearing was scheduled for 2pm but we didn’t get in front of the judge until 3:30. At 2pm Hambridge Homes barrister handed us their bundle, paperwork they’re legally obliged to give us at least 3 days before the hearing… The judge was given his bundle at 3:30… He was not happy about this and said so. Hambridge Homes barrister ignored all the laws the Overtons had breached, highlighted in our legal bundle but chose instead to fixate on the technicalities of the legal forms we non lawyers aka Litigants in Person had completed. He solely argued about us having completed part 7 instead of part 8. Hambridge Homes’ barrister also made no mention of the intimidation, bullying and distress we’d experienced for over two years also stated in our case against Hambridge Homes. 1- Sinister Porta Cabins: They raised their portacabins to the top of our garden walls, placing them so that the doors faced into and looked directly into our garden. 2 – Gestapo Style Lights: We were itching to tell the judge about the Gestapo style blazing lights the Overtons beamed aggressively into our bedrooms ALL night EVERY night?! We wanted to tell the judge about regularly coming home to find Hambridge Homes builders sat on our garden walls with their legs swinging nonchalantly over on our side of the walls. When we asked them to get off our garden walls, we were told to shut up and go into our houses. 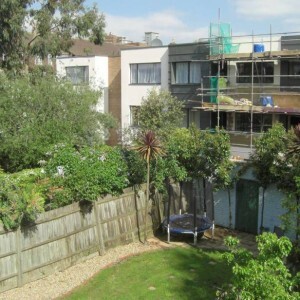 3 – Ugly Concrete Slabs Forcibly Stuck on Our Edwardian Brick Walls: We were keen to tell the judge to force Hambridge Homes to explain why they ignored planning laws (party walls) and stuck ugly prefab-like slabs of concrete on top of our brick Edwardian walls against our expressed wishes. 4 – Deep Internal & External Cracks: Since the erection of Hambridge Homes illegal buildings many of our properties now have ugly deep internal and external cracks caused by the earthquake like vibrations the Overtons deep excavations caused. Please help us get justice for all the injustice and wrong doings of Lambeth and their development partner Hambridge Homes. They both know that literally the only way for us to take them to task and force them to rectify ALL the problems they’ve caused it to take them to court and this costs money. Michael & James Overton’s Barrister: Hambridge Homes barrister tried to get the judge to throw our case out and ban us from ever taking Michael and James Overton to court again over ‘incorrect form filling’ but the judge refused to agree. The judge granted us more time to get our legal case together. He chastised Hambridge Homes legal team for failing to submit their legal bundle until the very second the hearing was due to begin. The judge adjourned our case and asked us to seek further advice re: completing the legal forms correctly. We’re ordinary folk not schooled in legal jargon, but we’re categorically certain numerous planning laws have been broken and our rights have been disregarded, for which we deserve & demand justice. Cressingham Gardens took Lambeth to court and won. Those against the Garden Bridge took Lambeth council to court and won. Neither defeat would have happened had they not taken Lambeth to court and exposed their illegal behaviour. Please help us do the same. Had both this cases not gone to court Lambeth would have got away once again with ‘cosying’ up to property developers against the needs of its residents…? Please help us get justice for our families, for our community, go to our link and donate to our Legal Fight Fund. Once you’ve donated please share, share and share with literally EVERYONE you know. People Power is literally the ONLY way forward. This entry was posted in Clapham Junction Action Group, Miscellaneous, Wandsworth Events and tagged Clapham Junction, events by Cyril Richert. Bookmark the permalink.